With over 15 schools represented at the recent Southeastern Conference Cycling Championships, the competition was fierce. On the line: Conference titles and invitations to the National Championships. Brevard College hosted and put on the most professional event of the season. 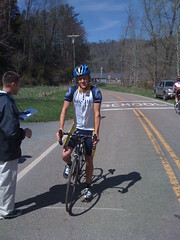 The racing for Mars Hill started on a sunny Saturday with the Road Race. In the Men’s A race of 62 miles, Nikola Milanovic rode strong throughout the race and finished 17th. The drama, however, occurred in the Women’s A race. Yolanda Colon looked set to take a big lead in the Women’s Individual Omnium until a metal screw punctured her rear tubular tire and drilled right through her carbon Zipp wheel. Literally screwed. After a wheel change, she pursued the lead group, which was now out of sight on the twisting course. Subsequently, Yolanda missed a turn on the course and rode some distance before realizing her mistake and eventually finding her way back to the start, missing out on scoring top points. Although she moved into the lead, it was only by 3 points over Julia Tillman of Brevard, with a Lees-McRae woman close behind. In the Men’s C Road Race, Yonatan Arnold put the hurt on the field on the climbs but lost contact on the final lap’s descent and hung on for a 7th place, his highest yet of the season. The Women B completed just one lap, at the end of which Melissa Holloway finished 4th and Ana Chocarro 5th. Sunday brought the criterium championships, albeit with cloudy skies, cooler temps, and more than a threat of rain. The Men’s C race was the first event and Yonatan continued to improve by making the break of four on the hilly course and eventualy sprinting to a solid 3rd place and ending up 10th overall for the season. Melissa and Ana continued their consistent results with a 4th and 6th place in their event, finishing 3rd (our second podium of the day) and 10th on the season. Nikola continued his consistent season by outlasting half of the field on the challenging course. Next up was Yolanda’s event. Only leading the overall standings by a slim margin, she got outwomanned by a large Lees-McRae squad working specifically against her and Brevard’s Tillman. Yolanda fought bravely and still managed to hold onto 2nd place in the overall standings, MHC’s strongest result ever. As a team, Mars Hill ended up 3rd in the Road Race and 3rd in the Criterium and 4th in the overall conference standings and earned the right to send its two A riders, Yolanda Colon and Nikola Milanovic, to the national championships in Fort Collins, CO, on May 8-10. Stay tuned for a report. Ryan Levander, in only his third bike race ever, stormed up the 5.3 mile mountain time trial from Valle Crucis to Banner Elk in 25:03 to claim 1st place (men’s C) for Mars Hill College by 23 seconds at the season’s penultimate race at Lees-McRae. Ryan has shown that he is among the favorites in his category to bring home a conference championship at Brevard College in two weeks.